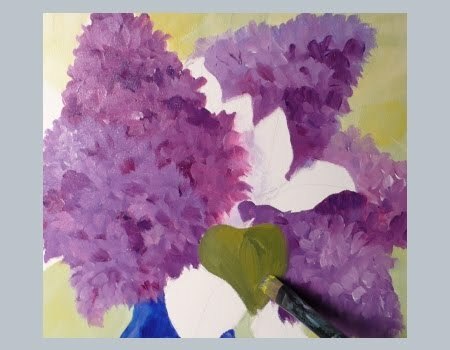 Welcome to my studio for a demonstration of an oil painting of flowers. 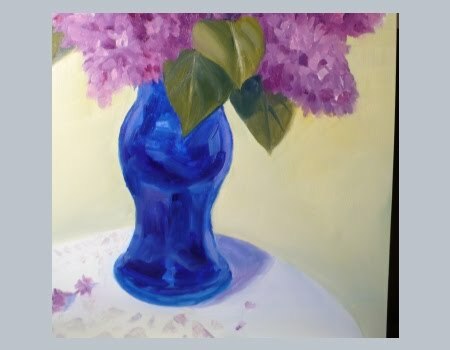 I've just picked some fresh lilacs from the garden and put them in my favorite blue glass vase. 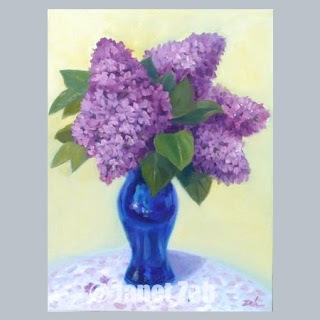 Lilacs are a favorite flower of mine, so perhaps I'll add another favorite to this painting - some lace. In the above image you see the lilacs I've picked on the left and the painting that I've begun on a 12"x 9" panel. I use Ampersand gessoboard because it's archival and has a brilliant white surface perfect for beautiful colors. The background is painted a soft color mixed from yellow, blue and white. I may lighten or warm this later, but this is fine for now. 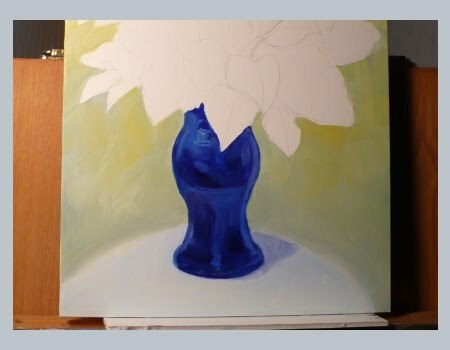 Next I start painting the vase. My students often will ask, "How do you get both sides of a vase to match?" This is not easy to do freehand, but I have some tricks and I'll share them with you. The first trick works for the initial drawing. I draw the vase freehand, then draw a line down the middle of it from top to bottom. Next, using trace paper, I trace one half of the vase - either the left or the right whichever looks better to me. After this, I flip the tracing over and lay it over the other half of the vase to see if my drawing matches up. If it does, all is well. If not, I make the necessary adjustments. Now, both sides match. 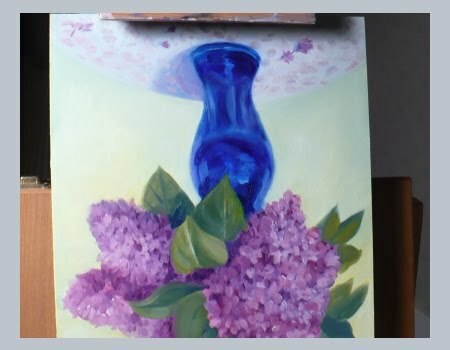 My first painting of the vase above looks fine because I painted carefully within the lines. But sometimes during the painting process, things can change. That's when I'll need to go back to my bag of tricks. I'll show you later. Next, I mix several shades of purple using a cool red and blues. 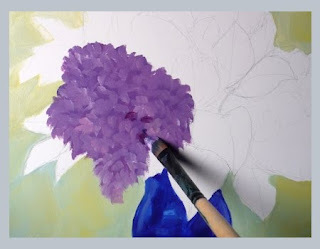 I paint a medium violet first as a base, then lighter blossoms over that. Finally I paint in some dark areas for depth. I am not looking to paint exact details in this piece. The leaves are painted with a mixture of warm yellow, blue and white using more blue for the darker tones and more yellow or white for the lighter. You can see in the above image that I've added a few blossoms that have fallen to the table and also started some detail to suggest lace. Just like with the flowers, I only suggest detail. But something doesn't look right. The bottom of the vase seems to have grown larger and a bit lopsided as I worked with it. The trace paper trick won't work since the paint is wet, so I'll have to try something else. My next trick is to use a mirror to look at the painting to see if it is really off. Oh my, it definitely is! Turning the painting upside down. This is a great thing to do to check a small painting. Can you see how lopsided the bottom of the vase is now? It is not as easy to see when the painting is upright. Our brains know what we should see and makes adjustments for us. We know something is not right, but it is not clear what. Turning a painting upside down or looking at it in the mirror helps us shake free of our too-clever minds and see clearly. Now I can work directly on the bottom of the vase while the piece is upside down because I can see what is needed. Here is the finished painting above. 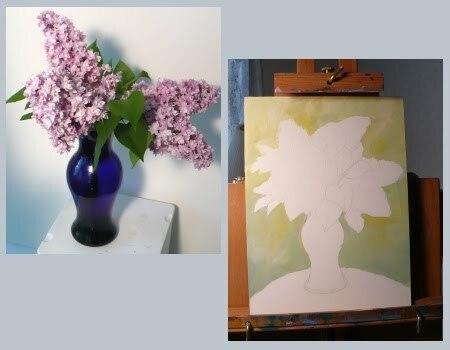 I've lightened and warmed the background, added lighter petals to the flowers where the light hits them and some highlights to the vase. I've also widened the table. It's amazing how detailed this painting looks, isn't it, even though I did not use much detail at all. I hope you enjoyed today's demonstration! Ahh, rich, buttery oil paints! Thanks for your tips on how to correct a vase's symmetry. I knew about turning it upside down, but I had never thought of using a mirror and tracing paper. That's brilliant. I really enjoy reading your comments. Your love of art really shines through!